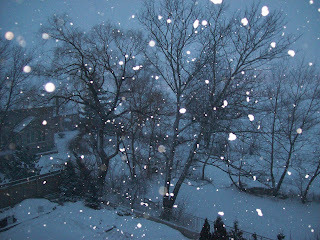 Today the snow started coming down in the early afternoon. Here's what I saw from my balcony a few hours ago. It's another one of those days when I love being indoors where it's warm and cozy. We found some lobster tails on sale earlier today, and I'm about to have a delicious dinner, thanks to Mom's excellent culinary skills! I'm planning to give up carbs, caffeine and alcohol for Lent. Accordingly, I've stocked up on veggies, meat, cheese, strawberries - those kinds of things. Yes, my motives are mixed because I am hoping to lose a few pounds, and I'm hoping the discipline encouraged by the Lenten season will help me to do it. I'm also hoping to save some money by not eating out during Lent. But believe me, giving up sweets, bread, rice, coffee, and good red wine will indeed be a sacrifice! I truly enjoy all of these things. I'll have to make a heroic effort to be more charitable since sugar-withdrawal usually tends to make me less charitable towards everyone in a ten-mile radius. My previous experience of low carb diets is that the first few days are usually the hardest - for me and for everyone else around me - until my system adjusts to the lack of sugar.